Catherine here. 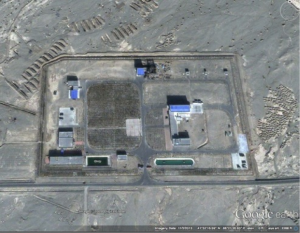 For the past year, Jeffrey and I have been looking at China’s Korla Missile Test Complex in Xinjiang, which is where we believe China conducts test launches of its hit-to-kill interceptor. Jeffrey put up a brief post about part of the site in August, after China conducted a missile defense test this summer on July 24, 2014. The US State Department characterized the event as an anti-satellite test, but Jeffrey likes to point out that it’s better to call it a hit-to-kill test. What it kills isn’t so important. We can now say with high confidence, based on some open-source research, many things about the Korla MTC including the location of many of its assets, that it is subordinate to the General Armaments Department (GAD) and the location of a number of previous missile defense tests. 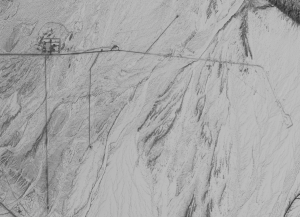 The main base is located at 41°42’37.76″N 86°11’22.69″E. The hit-to-kill launch site is located at 41°32’14.18″N 86°21’11.82″E. I enjoyed your Arms Control Work piece on tracking down the Korla test site. You mentioned in the post that you didn’t know if it was a GAD site. Perhaps you’ve already tracked this information down, but FWIW I found a website that lists GAD bases. There is one at Korla and it is identified as the 63618 unit. I also found a reference to this unit in a local government webpage for the Bayinguoleng Mongolian Autonomous Prefecture in Xinjiang, within which Korla is situated. The unit is identified as being situated in the outskirts of Korla city. Here’s a video from the unit made in 2010 to celebrate soldiers leaving the force. 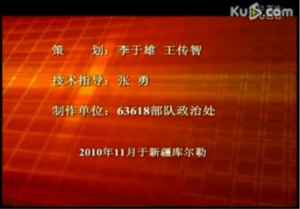 The credits at the end note that the movie was made by unit 63618 in Korla. The webpage of the Korla city government also refers to this unit. Judging from the topics of articles on CKNI that are co-authored by scholars affiliated with unit 63618, its work appears to be related to satellites and missiles (e.g. “Location Model and Error Analysis of Space Target Location by Early Warning Satellite” in Aerospace Electronic Warfare; “Detecting Probability Calculation on Moving Space Target of Space Detector” in Electronic Information Warfare Technology; and “Research on the effectiveness of early warning satellites to detect early warning indicator system” in Aerodynamic Missile Journal. 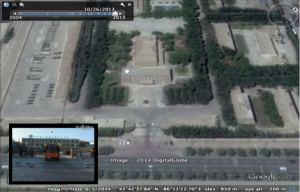 Unit 63618 appears to be subordinate to the Jiuquan Satellite Launch Center from the list of GAD bases Iain provided. Even without the GAD listing in Chinese, one can infer that Korla falls under Jiuquan. The ever-useful Directory of PRC Military Personalities lists the Jiuquan SLC as Base 20 (63600). The next base is Base 21 (63650). The Korla unit—numbered 63618—falls logically under Jiuquan. The available information confirms that Korla is subordinate to the General Armaments Department, which is responsible for developing things like hit-to-kill interceptors, and that personnel at Korla work on targeting things — missiles and satellites — in space. The Unit 63618 alumni video, though, was the real goldmine and crucial in geo-locating the unit. Videos bidding farewell to rotating personnel or remembering the anniversary of a particular unit often appear in internet searches. This type of media can provide helpful context of the environment in which a military unit spends its time and the necessary daily tasks of life it undertakes. Screenshot of the Unit 63618 alumni video title. 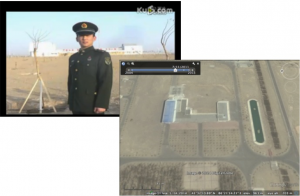 The Unit 63618 video contains ground-truth images of both the main base and the hit-to-kill launch site. 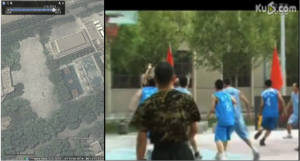 The most prominent features of the main base to match to the available satellite imagery include the main gate, the back of the building, and the base’s basketball court. These images provide visual confirmation of the location of the KMTC. The main gate of the KMTC. Basketball courts at the KMTC. Administrative building at the hit-to-kill launch site. Construction at the hit-to-kill launch site. The alumni video, made in 2010, clearly shows the hit-to-kill launch site under construction. This timeline also fits with the satellite images of the site, as well as the general development of the SC-19 interceptor program that began at the KMTC with the 2010 missile defense test. One thing we wanted to check was whether an interceptor launched from the KMTC could hit a test missile launched from the Jiuquan SLC, which is how the press reported a previous intercept test. David Wright from the Union of Concerned Scientists kindly modeled the test for us and analyzed the trajectories of the target and the interceptor vehicles (You can read a more thorough analysis on the test from David here). 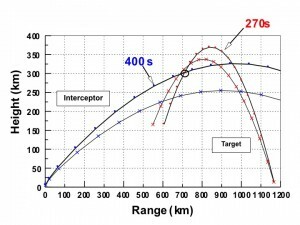 Two trajectories for both the interceptor (blue) and target (red) missiles. The dots show 30-second intervals, with the target missile launched at t = 0. Based on known and assumed parameters of the CSS-X-11 and SC-19 vehicles, David is reasonably confident that the intercept is possible and matches known timelines of the test. At this point, we’re probably polishing the cannonball, but we acquired satellite imagery of the KMTC on the day of a known missile defense test. That image also confirms the base’s involvement in missile defense testing. Through a generous imagery grant from the DigitalGlobe Foundation, we have a satellite image of the test facility on January 27, 2013. We weren’t lucky enough to capture the TEL on the launch pad, but there are many visible features that show preparations for an interceptor test. The hit-to-kill launch site on January 27, 2013. Image © DigitalGlobe. The launch pad has been cleared and there is significant vehicle activity at the facility, which is normally unused except during periods related to testing. Most important, the instrumentation sites have trailers in them, something that only occurs for tests. The administrative facilities and launchpad on the day of the January 27, 2013 test. Image © DigitalGlobe. The available satellite imagery strongly suggests the facility is active in HTK vehicle testing activities. Last thing! There is also a Large Phased Array Radar (LPAR) facility between the main base and the test base. Sean O’Connor identified the LPAR in 2009, located at 41°38’30.46″N 86°14’15.27″E. Obviously, an LPAR would be useful for looking at missile intercept tests. As you can see from the image, it turns. We weren’t able to get a picture of the LPAR on the day of the test — the picture cuts off — but that’s a signature for future use. In the left image, taken shortly before the January 2013 test, the LPAR is angled differently than in the right image, taken in October 2013. 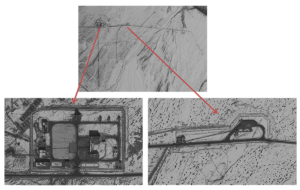 The satellite imagery, alumni videos, and listings of GAD units strongly indicate that the Korla Missile Test Complex is the test facility for HTK technology. The question of whether the tests at the KMTC are for missile defense purposes or ASAT development is far trickier to answer, as the HTK vehicle can be utilized for either purpose. This geo-location exercise raises a larger issue to which to return in future posts—although China is not very transparent in releasing official information on military programs, this is not the case when it comes to the ubiquitous information available on Chinese social media information platforms. Much incidental information, most of it mundane and about ordinary life, exists and helps to inform a broader picture of Chinese military capabilities. Of course, analysis of Chinese social media information requires diligence and caution, and review of official releases requires considering whether information was released as a part of “selective transparency.” But at the very least, policy experts should consider helping government-to-government exchanges to catch up to the transparency present in social media. In the case of missile defense testing, a reasonable step might be for China and the United States to exchange notifications of upcoming tests. the main test range hq in town. what you take for the main garrison in town seems to be just a low level unit associated with corla complex. it would be better to have a possibility to post .kmz files for such discussions. or just pics. Slightly off topic, the SC-19 designator would appear to indicate that the US first detected the missile at Jiuquan/Shuangchengzi. Is there any indication that it was ever launched from there, perhaps in a non-HTK role? SC-19 used in 2007 (Xichang) and 2010 (Jiuquan) ASAT tests. Good stuff! My question is, where would the intercept have occurred? Can you post an image of flight paths between the two sites you suggest? US intercepts, of course, occur over water, but does China have the luxury of safely intercepting over land? Okay, I stopped being so lazy. From the Shuangchengzi Space and Missile Center (40.9622°N 100.2888E)to the Korla Missile Test Complex (41.5377°N, 86.3721°E)is clearly lots of pretty unoccupied – but gorgeous – land. Yes, lots of unoccupied land! Also, about the January 27 image you have, what is the closest date you could get before that? So you could see if the TEL was there? I’d have to look back in the Digital Globe catalog (now I’m being lazy), but if I recall it was from December 2012. The January 27 image is from the morning–the test occurred at night, so my guess is that the image was taken just a few hours too early to capture the TEL, unfortunately. 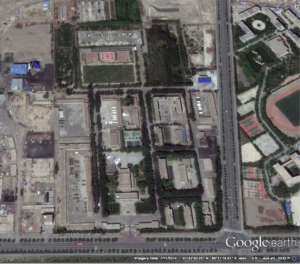 Speaking of Jiuquan, there’s a facility at 40.9113 N, 100.2222 E that’s undergone considerable development over the last decade. I think it might be connected with mobile missile/launcher work, but would any of you imagery gurus know for sure? Interesting. I’ll take a closer look next week. Anyone else think the test location might be a decent place from which to build up a BMD complex to defend Chinese ICBM assets near the Tibetan Plateau? The BMD architecture that is ‘plausible’ technically against full nuclear counterforce strike is pretty ugly to consider. If that was a serious question from your ‘day job’, support to answer it could be forthcoming. Could you help David Wright with reentry hazard NOTAMs from that test event? An interesting and informative exchange is also in the comments section from the intercept analysis image located at http://guests.armscontrolwonk.com/archive/5030/the-korla-missile-test-complex-revisited/slide1-2. Here is a copy of the exchange for the sake of completeness. Not sure what to make of it, but the target strikes me as emulating a lofted ballistic trajectory. If so, is there an advantage to doing that if this was an ‘ASAT’ test? Or if someone can run the numbers what was the range they were trying to emulate if this was actually a BMD test? I know we do all sorts of these things when we test our BMD systems. Hi Steve, You raise a very interesting point. But perhaps this question is better directed to David Wright, who wrote a companion post available at http://allthingsnuclear.org/chinas-january-2013-missile-defense-test/. Yes, this trajectory was lofted relative to a minimum-energy trajectory (MET). Launched on an MET, the target missile would have a range of 800 km and apogee of 200 km. Instead, this appears to have been lofted to have an apogee of around 350 km. A missile on an MET with an apogee of 350 km would have a range of about 1,400 km, but in that case the speed at intercept would be higher, so I’m not sure that was the point. There are a couple reasons China may have lofted the target. It might have wanted the target at higher altitude so it was easier to see by a distant tracking radar. It may also have wanted the intercept altitude to be in the neighborhood of 250 km since that is where it would expect to intercept a longer range missile. Intercepts for long-range US missile defense tests tend to be at around 230 km altitude. It may also be that putting the missile on more of a downward trajectory at intercept was intended to reduce the amount of debris that was kicked into orbit, although the speeds in this case of both missiles were low enough that there was likely not much concern about that. While the State Dept may call this an ASAT test, it doesn’t look very useful for that. The speed of the target missile was only 1.6 km/s at intercept, compared to a speed of about 7.5 km/s or so for a satellite in LEO. Similarly, the closing speed at intercept appears to have been about 5 km/s, compared to more than 10 km/s for an ASAT test. This looks more like testing hit-to-kill against a short or medium-range missile.